Plants have developed a robust system that stops their cell cycle in hostile environments such as abnormally hot temperatures. In response, they direct their energy to survival rather than growth. 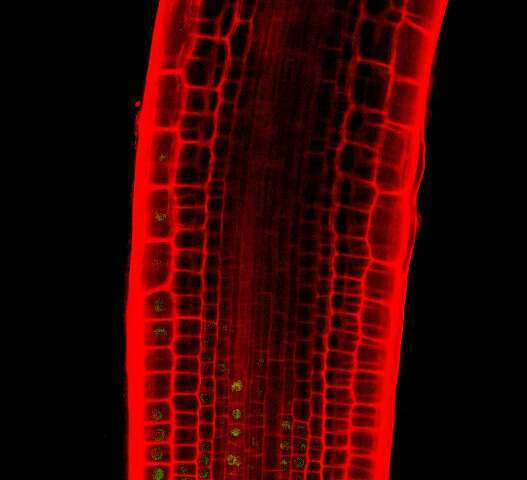 A new study led by scientists at the Nara Institute of Science and Technology (NAIST) reports in eLife that two transcription factors, ANAC044 and ANAC085, are critical for this response in the flowering plant Arabidopsis. The findings give clues on ways to modulate the growth of crops and other agriculture products. Upon DNA damage, plants and animals halt cell division and execute DNA repair. This response prevents the damaged cells from proliferating. NAIST Professor Masaaki Umeda has made a career studying the molecular biology behind this protective measure. "We reported that SOG1 is activated by DNA damage and regulates almost all genes induced by the damage," he says. Another study from the lab showed "Rep-MYBs are stabilized in DNA damage conditions to suppress cell division," he adds. In the laboratory's newest study, Umeda's research team shows that ANAC044 and ANAC085 act as a bridge between SOG1 and Rep-MYB. The scientists disrupted DNA in Arabidopsis cells by treating the cells with bleomycin, a compound commonly used to halt the growth of human cancer cells. The Arabidopsis cells failed to proliferate as expected unless they possessed a mutation in ANAC044 or ANAC085. In the mutant cases, the cells proliferated as though they were never exposed to bleomycin. "We found that ANAC044 and ANAC085 are essential for root growth retardation and stem cell death, but not for DNA repair," says Umeda. Specifically, ANAC044 and ANAC085 were responsible for preventing the cell cycle from proceeding from G2 phase to mitosis in response to the DNA damage. Rep-MYBs cause the same arrest in the cell cycle. Consistently, in normal cells, bleomycin caused a rise in the accumulation of Rep-MYBs, but not in cells with ANAC044 and ANAC085 mutations. These findings suggest ANAC044 and ANAC085 act as a bridge between SOG1 and Rep-MYBs in the halting of the cell cycle upon DNA damage. DNA damage is just one form of stress that can cause the cell cycle to pause. To investigate whether ANAC044 and ANAC085 act in response to other forms of external stress, the researchers exposed the cells to different temperatures and osmotic pressure which cause the retardation in G2 and G1 progression, respectively. Growth arrest was observed in both mutant and normal cells at a high osmotic pressure, but higher temperatures only caused pauses in the cell cycle in normal cells, indicating that ANAC044 and ANAC085 act as gatekeepers in the progression from the G2 phase in the cell cycle under abiotic stress conditions. The fact that ANAC044 and ANAC085 operate in response to different types of abiotic stress suggests to Umeda that they may be at the core of new technologies designed to modulate plant growth. "The research illuminates a new mechanism that optimizes organ growth under stressful conditions. When trying to increase plant productivity, scientists should consider ANAC044 and ANAC085," he says. More information: A regulatory module controlling stress-induced cell cycle arrest in Arabidopsis, eLife, 2019.